In a bowl, combine cracker crumbs, sugar, and butter. Press into the bottom of a muffin springform pan. Place on a baking sheet. Bake at 325 degrees for ten minutes. Cool on a wire rack. Pour over the crust. Return the cheesecake to the baking sheet.Bake the cheesecake on a baking sheet at 325 degrees for 30-40 minutes or until center is almost set. Cool on wire rack for 10 minutes. Carefully run a knife round edge of pan to loosen. Cool one hour longer. Remove the cheesecakes from the pan. 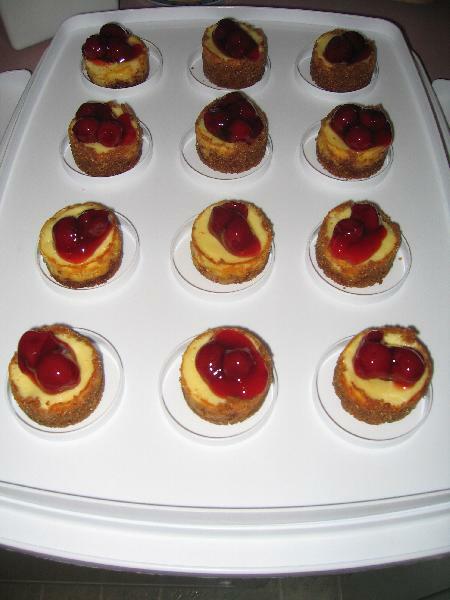 Spoon the cherry topping onto each cheesecake. Place in the fridge to keep cool.